Home » Accounting Dictionary » What is Vertical Analysis? Definition: Vertical analysis, also called common-size analysis, is a financial analysis tool that lists each line item on the financial statements as a percentage of its total category. In other words, it’s a method used to analyze financial statements by comparing individual entries as a proportion of their total accounts like assets, liabilities, and equity. What Does Vertical Analysis Mean? What is the definition of vertical analysis? The balance sheet uses this presentation on individual items like cash or a group of items like current assets. Cash is listed as an individual entry in the assets section with the total balance being listed on the left and its percentage of total assets being listed on the right. 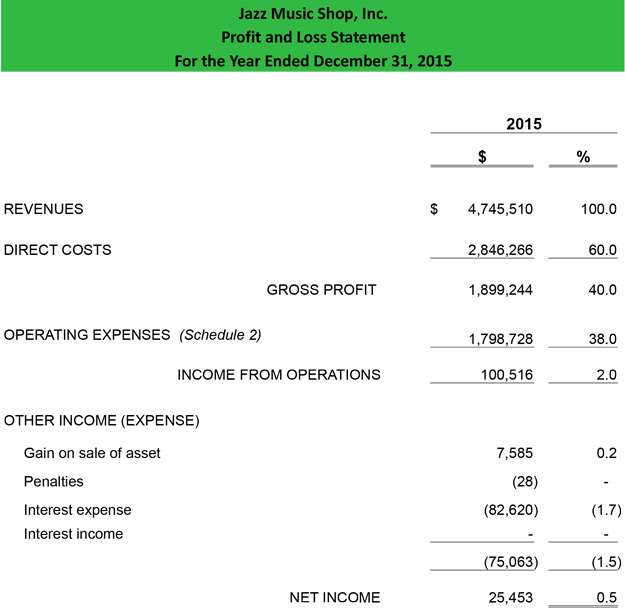 The income statement also uses this presentation with revenue entries referencing total revenues and expense entries referencing total expenses. Here’s an example. As you can see, each account is referenced in proportion to the total revenue. Managers use this to compare a company’s financial performance over time. Overall financial performance is usually analyzed with horizontal or ratio comparison tools. Vertical analysis is said to get its name from the up and down motion of your eyes as you scan the common-size financial statements during the analysis process. Most often, vertical analysis is used by management to find changes or variations in financial statement items of importance like individual asset accounts or asset groups. Vertical analysis follows the same concept as benchmarking. Management sets a base amount or benchmark goal to judge the success of the business. The base amount is usually taken from an aggregated from the same year’s financial statements. Then the common-size percentage formula can be applied to the financial item. The common-size percentage formula is calculated by dividing the analyzed item by the base amount of benchmark and multiplying it by 100. This percentage can be used to compare both balance sheet and income statementperformance within the company. Much like ratio analysis, vertical analysis allows financial information of a small company to be compared with that of a large company. The common size percentage can also be used to compare different companies within the same industry or companies that use different currencies. Define Vertical Analysis: Vertical analysis means a method of analyzing financial statement items by comparing their balances as ratios of the total account category balance. 1 What Does Vertical Analysis Mean?